*If you're not a resident of the U.S., all isn't lost. Scroll down to the paragraphs pertaining to you very special people. If eligible, how do you enter the book giveaway? Complete and submit a quick entry form. The information you share on the form will be used only for the purpose of this giveaway. Then it will be discarded. What are the books to be gifted (one copy each)? When is the deadline? Submit your entry form by midnight on December 8, 2015. Ten recipients will be selected at random and announced throughout the month of December. All books will be mailed to the recipients no later than January 15, 2016. What if you live outside the U.S.? Unfortunately you're not allowed to participate in the book giveaway, for legal reasons. But in lieu of that, please accept a free gift of music: `Tis a Gift: Christmas by Guitar, an album of tranquil holiday selections arranged and digitally recorded by Phyllis Cole-Dai, curator of A Year of Being Here. You can listen to its tracks here, and even download them as singles by clicking on the orange download link next to the titles. Go to Dropbox by clicking here (you don't need a Dropbox account). If you're prompted to sign up for Dropbox, click on the "No thanks, continue" option. Once you see the album playlist on your screen, click the blue "download" button in the upper-right corner of the window. Choose "Download as .zip" from the dropdown menu. Soon your computer should ask whether you wish to save the music in a certain location or to open (unzip) the files. Choose "Open with" [the name of a zip utility software will be displayed], then press "Enter." The software will eventually open or expand the album. This might take a few minutes. Your computer will store the music as "`Tis a Gift", probably in your "Downloads" folder. Click on "`Tis a Gift" to display the individual track titles. You can either play them from there or save them to another location. Amazing giveaway! A year's worth of meditation. Do the winners receive a copy of every book listed? You're very welcome! 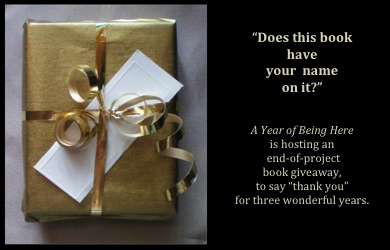 Hope you win a book, but if you don't, you might enjoy reading some on the list! I think, in some ways, we humans all live in some sort of "space between"--it can be painful, it can be joyous. To choose to live "spaciously" requires courage and intention, not to mention compassion. I bow to your choice. You inspire me. Thank you so much for your generous sharing of these fabulous contributions to my life view and emotional support. So many times the poem was meant for me on that day! They changed my view, garnered compassion, and eased my well being. I will miss your emails more than I can say! May you be on to more wonderful experiences and a life of "Well Being"! As for the poems often seeming "meant for you on that day," I think that speaks both to the power of the poetry and to your own receptivity. May you always be so. I remember your comment about that at the time. Poetry has such power to cross boundaries, unite, and comfort. May it continue to do so in your life, long after this project ends. And may your mother be always close in memory, Lucy. Your work, bringing together the beauty captured in photography and the profound wisdom captured in words has been a balm to the soul and a source of ongoing inspiration. Bless you for this work. Thank you, so much. I'm glad the poetry and artwork has comforted and inspired!